The information and materials presented in the Web Site have been prepared to provide useful background information about the law firm of Thomas J. Perkowski, Esq., PC. Articles and statements on this site are provided for general informational purposes only, are not intended to constitute legal advice of any sort, and should not be substituted for legal advice. The reader should not consider such information and materials to be an invitation to an attorney-client relationship with the law firm. The reader should always seek and retain competent legal counsel for legal advice in the appropriate jurisdiction, and not rely on the information and material presented in the Web Site for any purpose without the assistance of competent legal counsel. Thomas J. Perkowski is responsible for the content on this Web Site. However, links to other sites in our Library that are not operated by Thomas J. Perkowski, Esq., PC are not an endorsement or recommendation of those sites, and Thomas J. Perkowski is not responsible for the content of those sites. Prior results in cases reflected on the Web Site do not guarantee or suggest a similar outcome in other cases. 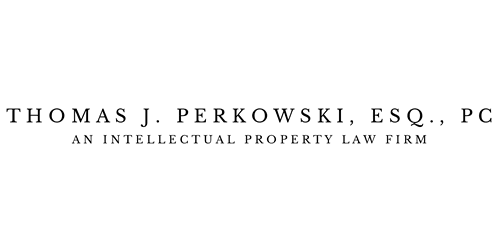 The servicemark "Protecting Leaders of Invention and Innovation" is exclusive intellectual property of Thomas J. Perkowski, Esq., PC in the field of legal and business counseling services. © 2000-2017 Thomas J. Perkowski, Esq., P.C. All rights are reserved.